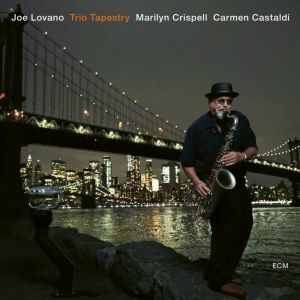 Joe Lovano (tenor saxophone, tarogato, gongs) Marilyn Crispell (piano) Carmen Castaldi (drums) Recorded March 27th -28th 2018 at Sear Sound Studios, New York. Joe Lovano’s association with ECM dates back to the early eighties and most notably the part he played in Paul Motian’s innovative trio of that period: other collaborations with the label’s roster of artists followed but, notwithstanding his increasing prominence, this is his first project for the label as a leader of his own group. Given the nature of the music it is easy to see why he would want to work with Manfred Either again because it fits the German record producer’s `power from a quiet place` ethos to a tee being a finely wrought combination of avant-garde classical processes expressed in jazz voicings of which Lovano’s characteristically feathery vibrato and asymmetric phrasing dominates. At first sight the unsuspecting listener, unfamiliar with Lovano’s style, could be lead astray. Firstly, the cover art: ECM’s usual arthouse aesthetic is set aside in favour of a colour portrait of Lovano, sax in hand, standing on the edge of New York’s East river in front of the Manhattan bridge with the brilliant night-time skyline in the background. Add to this track titles like `Razzle Dazzle` and `Sparkle Lights` and you might reasonably believe you were in for a bit of Broadway style bonhomie. Not the case; the music is for the most part exploratory, moody and meditative, emerging from fragments of chromatic atonal melody, the trio engaging in an intimate conversation and weaving a loosely constructed fabric of sound in which silences and implied rhythms are as important as the physical statements themselves. There is at times a nocturnal quality about the music which, considering the cover art, might invoke images of those lonely `nighthawk` characters hunched over bar counters in existential dialogue, that inhabit the paintings of Edward Hopper but for the most part it is another city in another time that most readily comes to mind; namely Vienna circa 1900. As I listened to pieces like `Mystic ‘and `Gong Episode` I was minded of the chamber music of Anton Webern or more the more recent work of Pierre Boulez in Paris. Then again the quiet revolution ushered in by Jimmy Giuffre with his 1961 `Fusion` and `Thesis` trios would appear to be a relevant source and even more so, his spontaneously improvised pieces with the bass clarinettist, Andre Jaume that came out in the nineties. Marylin Crispell, herself a noted avant-gardist through her previous association with Anthony Braxton, is a perfect partner in this enterprise, her rippling arpeggios in `Spirit Lake` and floating harmonics in `Rare Beauty` adding colouration to the somewhat austere whole whilst Castaldi’s percussive effects are applied with both delicacy and brooding menace, at times like a gathering storm heard from afar. Additionally, Lovano doubles on gongs, adding sounds which are reminiscent of eastern temple music and together they produce a suite of pieces that the leader cites as “some of the most intimate and personal music I’ve recorded so far”. It could be argued that the level of intimacy achieved excludes the listener who may feel that the artists are simply talking amongst themselves but high-art has always required a degree of effort on the part of its audience and Lovano, throughout his career, has always sought to push the boundaries beyond familiar expectations. His status and ubiquity as a performing artist suggests that there are many who are prepared to meet him more than half way and they will find this latest project a worthy addition to his impressive body of work.